This is the foremost part of the report and hence a summary of the whole project, its clients, funding and the team working on it should be provided here very briefly. This introduction may also contain background of the inception report, who created it, using what tools, information and sources and the limitations (if any) of this report. It is the key section of the report which explains why the project is needed and what is its expected impact on the area. It is also of importance to discuss here about the pre requisites of the projects and its expected results. Discuss here what the project is about, where it is getting the funding from, how it came into being and what progress (if any) has been achieved on the project till date. It contains a detailed account of the goals and objectives of a project and the implementation methods, approaches and mechanism to achieve those goals. It also identifies the different stakeholders of the project. Every geographic location has different characteristics and properties which in turn affects the feasibility and implementation of the project and its activities. 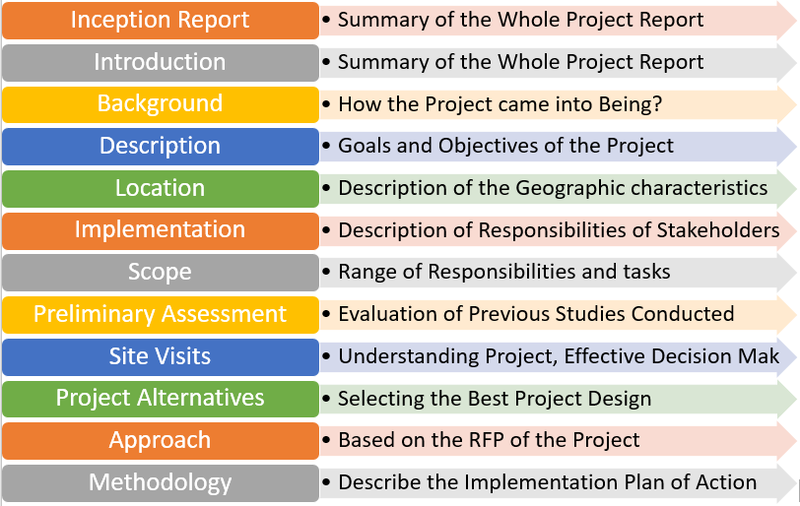 This section includes a narrative on the geographical location of the project, the surroundings physical features, other similar or relevant projects nearby, accessibility to the project site, coordinates of the area, climate, hazard profile of the region and other relevant geo-spatial information. A map of the area showing the location of the project site will also make things easier to understand for the readers of the report. This section describes the responsibilities of all the stakeholders of the project. It defines the roles of each stakeholder such as who is the client, who will fund the project, who will execute it and who will monitor/supervise the project. This definition of roles helps in smooth running of the project. It includes the definition of the range of responsibilities of the consultant. It includes the review of the feasibility study, preparation of tender documents, review contractor’s drawings/designs/data, supervision of construction, mobilization of staff, data collection, data verification etc. This section is dedicated to a study, assessment and evaluation of any previous studies/reports conducted on the project. It evaluates the limitations of the study and check if the results are still applicable or not. This section also takes into account the previous analysis performed (for instance sediment analysis, seismic analysis, availability of proposed construction materials, geotechnical investigations, resettlement plans etc.) during the studies and provides recommendations on whether any more or in-depth analysis is required or not. Study on social issues regarding the project etc. The site visits would have enabled the team to know about the accessibility of the project area. Here is an opportunity to state how the access conditions to the project site are, what roads to take, what are the alternatives routes, what are the pros and cons of each route and what mode of transportation is suited for the journey? Following the Desk Study, detailed, accurate and latest information can be gained through site reconnaissance, this involves a visit to the site for inspection. A list of the team goes here, with their qualification, experience and designation. Favorable in terms of cost, accessibility, construction etc. Discuss each alternative in the light of the above mentioned criteria (or your own criteria) and explain briefly how each one will be built/constructed. List the pros and cons of each alternative. Select one or two final designs based on the criteria for selection of the best project design. Also list any additional studies or resources required for help in choosing the best alternative or for furthering the work in the selected project design. This is arguably the most important section in the report, as the content of this section will show how much the author of this inception report has understood the project and what ways and line of action will be adopted for the efficient implementation of the project activities. It can be started from providing general project information, capacity, pros, client info, funding sources, duration completion etc. and the working mechanism for execution of the design. The approach and methodology should be based on the RFP (Request for Proposal) by the client at the start of the project along with the firm’s own experience and exposure to similar projects. The firm should start explaining its approach by list the team it has gathered to work on the project. Then, it should go on to explain its approach towards various activities of the project like planning, designing, procurement, hiring, construction, monitoring, evaluation etc. 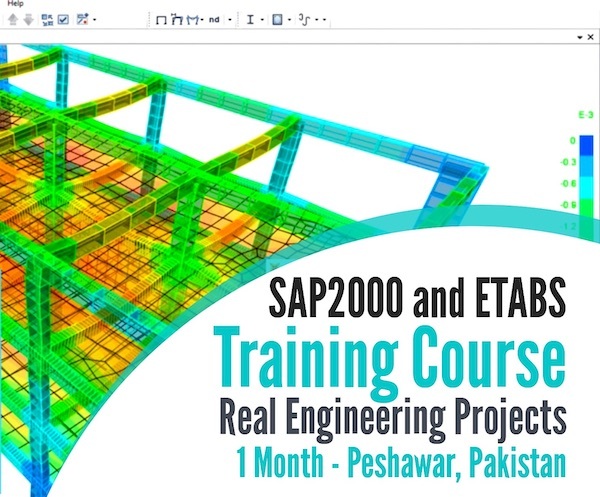 Add a table for the team having their names, qualification, experience, designation in the project. Define ways and mechanisms that will be used for information exchange, communication, financial and progress reporting, equipment (hardware and software) to be used, field or branch offices established, if any regarding the project. Explain what methods will be used to run/implement project activities in a timely and budget efficient method? What research methods will be used to collect the required information and why? What tests/studies will you conduct? 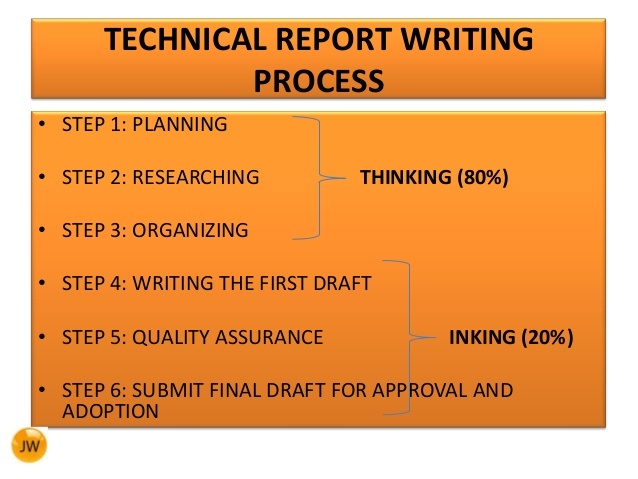 What tasks are to be performed and who will perform it? The construction phase may be divided into a single or more than one phases, with each phase defined separately.